Whether you’ve recently had paint protection film applied to your car, or are considering having it done, you’re probably wondering what aftercare involves. 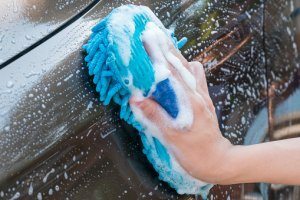 How should you clean or wash your car? Is there anything special you need to do to protect the film? How can you get the most out of the wise investment you’ve made? We know you have a lot of questions. But, don’t worry, we’ve got the answers! Three Rivers Auto Glass has been providing premier services in and around Pittsburgh for more than 40 years, and we’re experts at paint protection Pittsburgh. Below, you’ll find some helpful tips. The goal of paint protection is to maintain your paintwork’s color and shine and protect it from damage. But even with Pittsburgh paint protection, your car will still get dirty—and you’ll still need to wash it regularly, and properly, if you want to achieve these goals. Get the right products. You can’t clean your car using the same products and accessories you use to clean your household surfaces and appliances. Household chemicals are not intended for use on vehicles, and many can damage your paintwork and/or protective film. Instead, you should use dedicated products made specifically for automobiles. And you should use a micro-fiber cloth, mitt, or towel, rather than an “old rag” or dish towel, etc. Be in the right place, at the right time. Generally speaking, you should not wash your car in direct sunlight or when the surface is hot to touch. Sunlight and heat can make washing more difficult and lasts longer, can cause water spotting, and can decrease the effectiveness of the cleaning agents you use. Rinse before you wash. Before you start washing your car, rinse it thoroughly, starting with the wheels. This will remove the bulk of dirt and debris from your vehicle and prevent you from making a bigger mess or scratching your finish. Wash using the “two bucket” method. Set up two buckets of water, one that contains soap and one contains clean rinse water. Dip your mitt into the soapy water bucket; clean a panel; then dip your mitt in the rinse bucket before moving onto the next panel and repeating these steps. This has long been the preferred method of car-washing, as it prevents you from accumulating debris on your mitt, which could cause swirl marks or damage your paintwork and/or paint protection film. Rinse after you wash. You have to rinse after you wash, to clear off any remaining debris and prevent soap and/or water spotting. Be patient and wash and rinse one section at a time. Approaching your vehicle one section at a time is another great way to avoid accumulating debris on your mitt and will help make the otherwise burdensome process of washing your car less overwhelming. Avoid air-drying your vehicle. Air drying can cause water spots. So, we recommend that you use a waffle-weave towel or air-blower instead so that your car can look its best. Do not use an automated car wash. Automated car washes may seem like a great way to save time and energy. But, sadly, these savings frequently come at a cost. Automated systems sometimes malfunction or become “beat up,” resulting in equipment or chemical failures that could damage your vehicle. Taking a hands-on approach is much safer and will ensure that your car is thoroughly and effectively cleaned. In addition to the general car-washing tips above, there are a few other things you should keep in mind when caring for your paint-protected vehicle, as follows. Do not wash your vehicle for a week after installation. After your paint protection film is installed, it will need time to cure and set. We recommend waiting 7 days after installation before washing your car. Do not use, or do, anything “harsh.” Paint protection film is durable, but it’s not imperviable—and the harsher you treat it, the more likely you are to damage it and decrease its effectiveness. We recommend using a mild dedicated soap and avoiding specialty cleaners for bug, tar, and sap removal, as these products usually contain abrasive chemicals. Also, make sure YOU aren’t harsh on your car. Be gentle when cleaning it and practice common sense. Do not use a pressure washer unless you are highly experienced with it, and do not use a powered buffer under any circumstances. Do not let sticky stuff stick. Whenever you notice debris such as tree sap, bug splatter, or bird droppings on your car, you should clean it off immediately, so as to prevent chemical erosion and other negative effects. When “spot cleaning” your vehicle to remove such things, you should use the same techniques and principles discussed above. Make sure to wet the affected area before cleaning it, and do not attempt to peel off debris or otherwise remove it from dry film. At Three Rivers Auto Glass, we know how important the appearance and performance of your vehicle are to you, and we’d be more than happy to answer any additional questions you may have about paint protection Pittsburgh. Just give us a call or stop into any one of our six greater-Pittsburgh area shops to learn more.